To check your Payment Methods click on Config → Finance → Payment Methods. Payment methods listed here are set by default. When you install a new Payment Modul it will automatically appear here. You can add a new Payment method manually by clicking Add icon at the top-right corner of the screen. The window will pop-up where you will write the name of the Payment Method and enable the option "Active". After adding a new Payment method it will appear in each customer Billing settings in Customers → View →Billing →Billing overview. 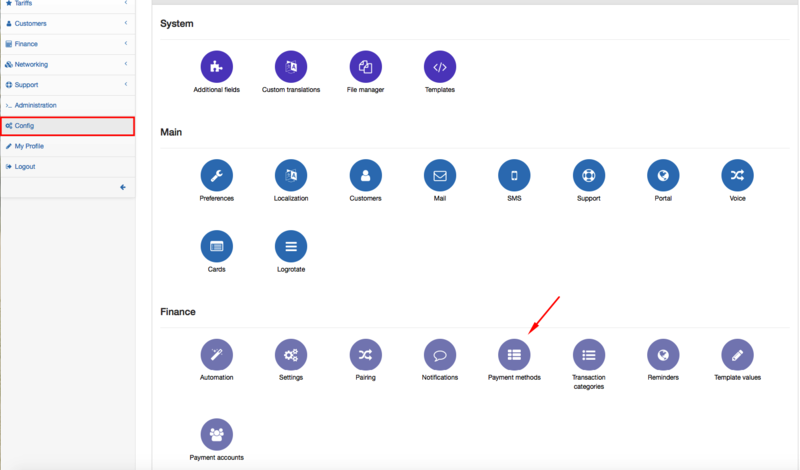 It is possible to Edit (Rename) or Delete Payment methods by clicking on icons and in Actions section of the table.